But of course the Swiss vote was more than a matter of bricks and mortar. It was a provocative statement on nationalism, religion, immigration, cultural competition and, ultimately, the future of the West. Here’s what happened. Responding to a vigorous campaign by the right-wing Swiss People’s Party (and defying the official position taken by the goverment), 57 percent of voters — and 22 of the country’s 26 cantons — agreed that the pointy-topped Islamic architectural embellishments deserved no sanctuary in Switzerland. The anti-minaret faction saw the offending towers as a political symbol of Islamist fervor; the pro-minaret party stressed the need for religious tolerance. As a congenital moderate, I can see both sides of the argument. My inner nationalist laments the defiling of pristine European cultures by non-assimilated, non-native elements. The U.S. is a melting pot by nature; Switzerland, though historically tri-lingual, has always displayed a unique quality of Swissness that stamps its character. Think of Heidi, William Tell, meticulous mustachioed watchmakers, Alpine pastures and fondue pots. As much as I love halvah and shish-kebab, those robust Eastern delicacies are simply out of place in the shadow of the Matterhorn. Of course, my inner Classical Liberal believes that no religion should be suppressed by vote or decree. But what exactly were the Swiss voters deciding when they put the brakes on the burgeoning minaret industry? Were they sending a xenophobic message to their Muslim neighbors… or were they looking to the future, delivering a pre-emptive strike on militant Islam and Sharia law before they could gain a foothold in Switzerland? Switzerland is six percent Muslim, a number that started at zero only a few decades ago. Given the disparity between native European and Muslim birth rates, you can safely bet that the number is pointed upward. Switzerland already harbors around 150 mosques — should we be alarmed? How could any reasonable person expect the Swiss to tolerate the sound of Muslim muezzins calling the faithful to prayer — six times a day, starting at dawn? President Obama has referred to the muezzin’s call as “one of the prettiest sounds on earth.” (Naturally, that statement ignited more than a little hysteria on the right.) Having heard the call myself while standing atop a medieval tower in Istanbul, I can’t entirely disagree with the president. But aesthetics aren’t the issue here — neither the architectural aesthetics of the minarets nor the vocal aesthetics of the call to prayer. Religious freedom isn’t the issue, either; the Swiss haven’t prohibited or even restricted anyone’s right to practice Islam. The crux of the matter is symbolism: whether the West should welcome highly visible emblems of a religion that, in its fundamentalist form, calls for the forced conversion (and, failing that, the divinely-sanctioned destruction) of us infidels. Muslim fundamentalists are at war with the West. We didn’t ask them to make war on us, but here we are anyway. If the fundamentalists had their way, every nation in the West would bow to Mecca and submit to Sharia law. Obviously we can’t permit that kind of cultural transformation in our own societies. But how do we hold back the tide without sending a message of intolerance toward inoffensive moderate Muslims? Can European societies declare that their vaunted guest-worker programs were a disaster, and send their Muslims packing? No, too late for that. So we’re left with banning public symbols. That’s about all we can do at this point without either compromising our stance on religious tolerance or abandoning Western civilization to the fanatics. It’s a reasonably moderate position, if we can keep it. I suppose we can also pray that Jehovah will help keep Allah’s legions in check. Wait… they’re the same god? Never mind. Historically, a church was raised to establish the religion of the land. Europe, for hundreds of years is known to be Christian. You can see thousands of churches: Catholic, Orthodox and recently Protestant (still Christian). Most of the Orthodox churches in Romania were raised by Romanian kings, after a winning war against Turks or Muslim nations, that wanted to conquer Europe going through Romania or other countries. Romania is proud that only a few minarets were built when Turks invaded Romania. For me, building a church is a sign of conquering, even in these modern times. Religion tolerance is an oxymoron. There was, is and will be religious clashes. 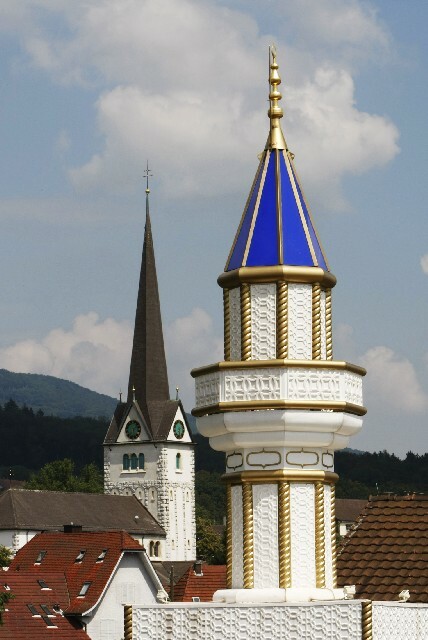 I applaud Switzerland and other countries in Europe that oppose the construction of minarets because Europeans do not build anymore “old” Christian churches (there is no “new” style minarets). The US of A may be some kind of “melting pot”, but religion is in disarray trying to fit a more secular society approach. Just for the sake of the show, US can still approve the minarets construction, but Europeans cannot afford that. If you ban minarets, you must ban church steeples too, no favor. But Europe has a serious problem with muslim immigration. Due to their extremly backwards religion, most muslim nations stopped progressing after the dark ages, but with all that oil money, they didn’t have too. Now, woth out of control populations and fundamentalism, all they have to export is oil and craziness. When these first gen. immigrants move to Europe to take the crap jobs Europeans won’t due (Like Americans) their children resent that their social status is so low, and you wind up with ghettos, full of under and uneducated, militant, idiots that refuse to assimilate into their new country. Not to sound paranoid, but it is an idealogical invasion. When you invade a country, and intend to stay [take note, gov’t spies(definitely not paranoid…)] you convert the population to your way of thinking, to merge the diferent cultures into one cohesive unit. Like when African slaves were converted to Christianity. The problem is when people don’t blend (Afro-centrists, Muslim fundamentalists) and you create underclasses, which fracture countries. Look at nations today, they may preach that your differences are strengths, but that’s because their’s still a majority runing the country with common values. All of Europe before the World Wars was ethnically diverse, so they did the European solution, genocide. All the ethnic minorities were quietly expelled or executed, so that now, everybody can get along… As long as they do it on their own land. Here, the black and hispanic minorities are all uderclasses because the blacks look different, or are militant, and the hispanics “don’t speak no Amurhican” the group that did intergrate fairly well was the Asian minority, which learned english, and got educated, and is statisticaly smarter than the white majority. As I have said before, unbalanced extremes break the scale, the only path is moderation, or, in this case, blending. That said, majorities shoud do more to welcome, intergate, and adapt to diferent people, not exlude further, like banning major parts of their culture. TK: You mentioned Asian immigrants, which started me thinking. Many Asians haven’t assimilated the way ethnic Europeans did in the U.S. (Look at the Chinatowns in various cities.) Yet they’ve never posed a problem because they tend to be law-abiding, industrious and academically ambitious. They never invaded the country in vast numbers, and most of them are here legally. They pay taxes and contribute to the system. They don’t have more children than they (or we) can handle. In short, they’re responsible citizens. All this is a huge generalization, of course, but I think it explains why assimilation probably isn’t the number one criterion for successful immigration. In a sense, the Asians already had values comparable to ours before they settled here. Or the Hmung (Vietnamese? ), who have a much lower education and alchoholism rate. (among the men anyway) Sure not all Immigrants intergrate, (or some of us cynics…) the point I was making is that ~50% of America’s Asian population is college educated. As to law abiding, you do get Asian gangs/triads whatever, and on the similar values Asian immigrants have, I’d have to say they have SUPEIROR values. Look at the stereotypes about hardworking, disciplined, Asians. Then look at the disciplined to point of tryanny China. Note, China is a communist nation, that hasn’t failed. (like the USSR) Chenk my post on Capitalism, and the current economic system in China,(semi-totalitarian/socialist/limited capitalism) and you’ll see my point. In the first sentence I made a bit of an error, “Or the Hmung (Vietnamese? ), who have a much lower education and alchoholism rate.” I should have put “higher” alchoholism rate, just clearing that up, sorry.